There are so many things I would really like to blog about: I want to respond to Major Steel's entry about the music he loved in college and discuss this review I read on Salon of this book I really want to read, This Is Your Brain on Music by Daniel J. Levitin. I have written nothing about Sunstone except an intro to the synposis I plan eventually to write. 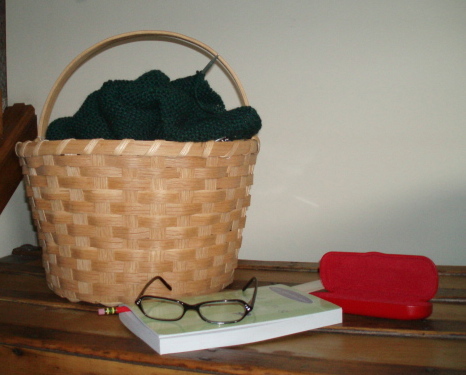 I reallly do intend to blog about knitting some day, though knitting is for me like being in love in that I find it so rewarding that I'd rather do it than write about it. Anyway, those are among the many topics I hope to find time to write about soon, but in the meantime you're getting a picture of my new glasses (which I am wearing this very moment, having picked them up yesterday--they are less cat-eye-ish than I remembered but at least the rhinestones are really truly there) perched on the book I'm currently reading in front of the basket where I store my knitting, which is currently a sweater I'm almost finished knitting. I like your picture Holly. It is a reminder to me that I should spend more time doing things I enjoy. Wonderful glasses! Those are a great shape and should convey scholarly seriousness despite the rhinestones. You could almost call your composition a self-portrait, couldn't you? You just did blog about all those things! And included a picture. The glasses are very cool with the rhinestones. Glad you all liked the photos. I never considered myself much of a photographer but perhaps that will change now that I can be instantly gratified by seeing my images and can also fiddle with them, crop them, rotate them, etc etc. In any event, now that I finally know how to use my camera, you can expect to see lots more photos on my blog. This page contains a single entry by Holly published on September 9, 2006 12:25 PM. Feminist Carnival, Again was the previous entry in this blog. An Enthusiastic Passenger of the Latest Bandwagon I'm Aboard is the next entry in this blog.